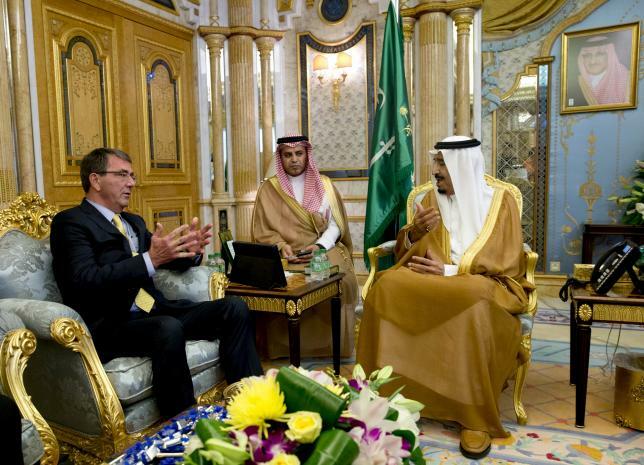 JEDDAH – US Defense Secretary Ash Carter said after talks in Saudi Arabia that Iran’s “potential for aggression” was a shared concern as he moved to bolster defense ties with Riyadh following a nuclear agreement with its arch-foe. The conservative, mainly Sunni Muslim kingdom is engaged in a contest for power with Shi’ite Iran stretching across the region. It fears the nuclear deal will free Tehran from international pressure and sanctions, giving it more room to back allies in conflicts from Syria to Yemen. Since Salman became king in January, he has tried to build a Sunni coalition against Iran’s regional allies, boosting support for rebels against Syria’s President Bashar al-Assad and waging war against Yemen’s Houthi militia. In the talks, Salman and his defense minister reiterated their public support for the deal while voicing some reservations, like the need to properly implement the accord, Carter said. He said discussions in Jeddah focused on advancing security ties, including in missile defenses, cyber, maritime security and special operations forces, following up commitments made by Gulf states at a summit at Camp David in May. Carter sought to emphasize US and Saudi concern about Iran, citing “malign activities in the region and potential for aggression”. He singled Iran out along with Islamic State militants – who Tehran is currently fighting – as the top two shared challenges facing both nations and noted concerns in Yemen. “The Iranian influence with the Houthis is real,” Carter said. Carter said Saudi King Salman, the most powerful of the Gulf monarchs, would visit the United States and meet President Barack Obama in September. In May, Salman’s abrupt decision to skip the summit of Gulf leaders that Obama hosted at the Camp David presidential retreat raised speculation of a diplomatic snub, despite denial in both countries.